Region: Lower Southwest Michigan. Halfway between Chicago and Detroit on Route 60. 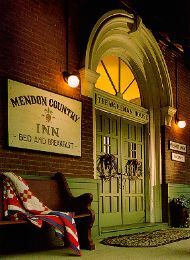 The Mendon Country Inn Bed & Breakfast offers 9 Jacuzzi/Fireplace Suites and 9 Regular Double Rooms all with private bath. There are 3 buildings, the 1873 Stagecoach Inn which houses 2 Jacuzzi suites and all the regular rooms. The Puddleburg Room is a large comfortable room where breakfast is served around the large central fireplace and is also used by guests for reading, relaxing with board games or playing the piano. The "Rooftop Garden" offers a view of the creek and is a great place to read and relax or sunbathe. The rolling lawns are great for crochet or you can take a walk through the woods on the 14 acres of grounds. The 2 Innkeepers Cottage Suites are adjacent to the Inn and each suite has its own Queen bed, fireplace and large jacuzzi as well as private bathroom, bar fridge and coffee making facilities. Creekside Lodge is situated at the back of our 14 acres, overlooking the creek with rolling lawns and its own putting green. There are 5 DeLuxe suites offering Queen bed, fireplace, jacuzzi and private bath. The Kiva and Kisha common rooms offer relaxing facilities for reading, board games, fireplace & a cedar sauna. Crochet and volley ball are available. Canoeing, fishing and biking are availabe from the Inn as well as bar-b-q facilities. Your hosts endeavor to provide you with the comforts of home, the friendliness of small town life, a part of history and a truly enjoyable visit. Rates : $69 - $159 sharing, including Gourmet Breakfast provided by your Host & Chef, Geff Clarke. Ask about our Golden Getaway Special & Speciality Weekend Packages.